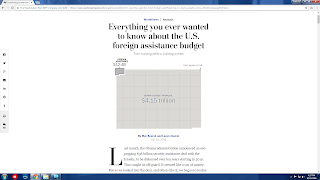 I saw an article on in the Washington Post this week providing a set of cartograms highlighting the spending by the U.S. on foreign assistance. I love incorporating cartograms periodically with my students; it's a great geography skill to review or teach, and it really allows them to visualize quantitative information in a different way. This article also allows you to incorporate some discussion of macroeconomics principles. There's definitely plenty of material for group discussions and debates. Online resources really give interesting information and awesome presentations even of some boring facts. First of all, thank you for the idea. Nowadays, there are excellent blogs where real specialists post the latest news and tips. Moreover, there are various forums where you can ask questions and find interesting ideas. It was a great surprise that there are even experts who give answers there. For example, I found several answers by good financial services and it appeared that it is a big website representative, who also offers various blog posts and money and budgeting. Asthma is a common disease in children and adults. Child asthma finds amazing cure with homeopathic treatment. For more info Asthma treatment in homeopathy. Get Best Assignment Help Sydney While you pursue your dream education in Australia. Hire PhD Level Experts with 10 Years Experience for your Assistance. if you want more just look here "help"